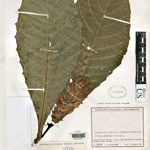 The plant collections of the Smithsonian Institution began with the acquisition of specimens collected by the United States Exploring Expedition (1838-1842). 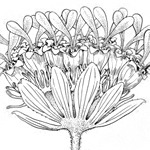 These formed the foundation of a National Herbarium which today numbers over 5 million historical plant records, placing it among the world's largest and most important. Over 1.7 million specimen records (including over 113,000 type specimens with images) are currently available in this online catalog. Select a tab on this page to search by Keyword or Selected Fields. Searches are limited to 10000 records and the results are sorted by taxonomic group. If you need to retrieve a larger record set, contact the Department of Botany's Data Manager. Some lists are linked, so for example, choosing a Country narrows the choices for Province/State/Territory, and District/County. Dropdown choices also narrow as you type, for example, typing zing in the Family field might narrow the choice to Zingiberaceae. Click on the scientific name to view the full record. Click on the thumbnail to view larger resolutions of the image. Use Control+Click (Command+Click) to open a new browser tab. Open the full collection record by clicking the expansion button ( ) in Grid View, on the scientific name in Sheet View, or anywhere within the image frame in Gallery View. Inverse expansion buttons ( ) indicate records with multimedia (typically, images). Export all or selected results by clicking the Export Results as CSV button in the bottom toolbar in Grid , Sheet, or Gallery View. Query results are limited to 10000 records. Avoid very general queries that return very large numbers of records, e.g. searching for poaceae. One or more BARCODES, e.g.